The Kilkenny Ridge Traverse is a moderate 2-3 day, 27 mile scenic traverse of some of wildest and remote scenery in the White Mountains. It’s a particularly attractive route for backpackers interested in avoiding the crowds of day hikers who frequent the southern and central Whites. Bearded trees, their branches and trunks festooned with moss and fungus, line the ridgeline, battered by wind and storms. Open ledges and summits provide magnificent views of the entire ridge as it undulates north to south, past vast stands of forest shrouded in mist and cloud, with scant evidence of a human presence. Hikers climb two White Mountain 4000-footers, Mt Cabot and Mt Waumbek, in addition to several smaller peaks called The Bulge, The Horn, and Mt Starr King, at the south end of the route. Side trips to a narrow canyon named the Devil’s Hopyard, Roger’s Ledge, Unknown Pond, and the Mt Cabot Fire Warden’s Cabin add to the novelty of this less-visited region. Backcountry Camping Regulations for the White Mountain National Forest. New to the White Mountains? Read this Quick and Dirty Guide to Backpacking in the White Mountains for information about camping regulations, road access, trail shuttles, lodging, dangerous wildlife, weather, etc. Starr King Trailhead: There is additional hiker parking across from the road leading to the Starr King Parking Lot along Rt 2 next to a stone monument. The route follows the following trails in sequence. Refer to the AMC White Mountain Trail Map 6 – North Country, Mahoosuc Range (2017 ed), which is the best waterproof map available for this region, although I’d recommend buying the complete AMC White Mountain Waterproof Map Set (2017 ed) rather than one map at a time. More detailed trail descriptions can be found in the AMC White Mountain Guide (2017 ed), which is considered the hiking bible for the region. Take photos of the pages using your phone for easy reference, instead of carrying the entire book with you on hikes. The following list provides cumulate distances on the route to each view or landmark. 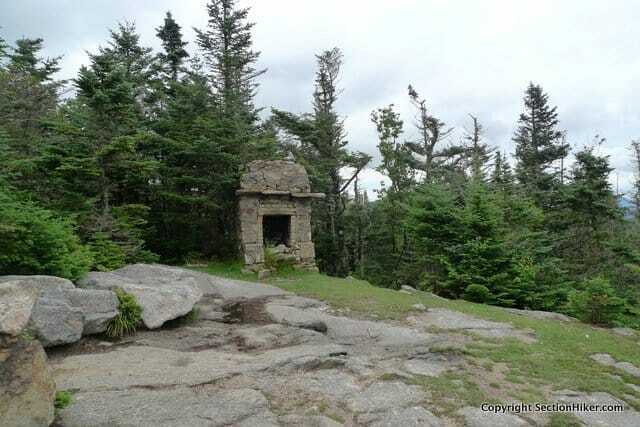 USFS Rogers Ledge Tentsite (Free) – Four tent pads and an outhouse. No web page. Marked on most maps. USFS Unknown Pond Tentsite (Free) – There is an outhouse, 6 designated camping spaces including a group site near the entrance) and reliable water from the pond or stream. USFS Cabot Firewarden’s Cabin (Free) – There is an outhouse and space for 8 on bunks in the cabin. It’s not exactly super clean inside with peeling paint and assorted debris, but you can sleep inside in a pinch. I did it once myself. Natural water sources are plentiful in the White Mountains although you may need to descend to them from ridgelines along side trails if you run short. In any case, carry a detailed topographic map with you and don’t rely on the overview map provided with this trip description to find water sources. Guthook Guides does not have a map of the North Country yet (as of 3/18), so you’ll need to rely on the USGS maps in the Gaia Smartphone App or a GPS Receiver if you want digital mapping support. While the topographic information found on USGS maps for this area is quite accurate, be aware that the trail information is frequently out of date or omitted. Carrying the AMC maps listed above is really your best option. There are also several dry stretches along this route where it may be prudent to carry extra water. These include the stretch of trail between Unknown Pond and the York Pond Trail (the spring below Mt Cabot is difficult to locate and may be dry) and between the York Pond Trail and the Starr King Trailhead. If you don’t find water directly on the Kilkenny Trail, it’s usually just a short distance down one of these side trails. This route experiences frequent blowdowns (trees knocked over by wind and snow) in winter, which may obscure the trail each spring, before trail crews can remove them. The greatest damage usually occurs along the stretch from the Kilkenny Ridge Trail/York Pond Trail junction south to Mt Waumbek. The trail is usually quite obvious despite these obstacles and blazed in yellow. Other than that, this route is almost entirely below treeline and well protected from the weather. The Kilkenny Ridge Trail starts at the south end of the South Pond Recreation Area. The trail enters the woods and quickly comes to a junction with the Devil’s Hopyard Trail. This side trail leads to a gorge with steep sidewalls and “huge boulders set in picturesque confusion.” While not up to the caliber of Mahoosuc Notch farther north (also in the White Mountains), it is still a fun diversion and provides one with a first glimpse of the unusual foliage and scenery found along the rest of the Kilkenny Ridge Trail. After you’ve hiked to the end of the Devil’s Hopyard, retrace your steps to the Kilkenny Ridge Trail junction and continue south. Continue through birch forest before climbing moderately to Rogers Ledge at 5.3 miles, a large south-facing cliff with a huge view of the Pliny Range to your right. You can even the see high peaks of Presidential Range from this vantage point, far to the south, on a clear day. Descending Rogers Ledge, you’ll pass a spur trail to the Roger’s Ledge campsite in 0.5 miles, followed shortly by the Mill Brook Trail Junction. Continue past it heading south along the Kilkenny Ridge Trail, entering a boggy area near Kilback Pond. Hike over bog bridges before climbing the shoulder of Unknown Pond Peak, a 3500′ trail-less mountain before dropping down to the Unknown Pond Campsite at the junction of the Unknown Pond Trail. This pond is a pretty place camp and a great place to watch the sun set over The Horn. However, camping is only permitted at the designated campsite and not within 0.25 miles of the pond or along its shore. Return to the Kilkenny Ridge Trail which runs along the north side of the pond before climbing to The Horn and The Bulge, two distinct viewpoints before Mt Cabot. A short spur trail leads to The Horn, which is topped by a rocky ledge. The best way to climb it is around the back side, although it can be a difficult solo scramble. Retrace your steps to the Kilkenny Ridge Trail and resume hiking south to the summit of The Bulge, before climbing steeply to Mt Cabot, passing a summit sign at 10.8 miles. Beyond the summit, the trail passes a side path that leads to an unreliable and often hard-to-find spring (it’s best not to count on this water source) before arriving at the former Mt Cabot Fire Wardens Cabin. The interior of this cabin has two rooms: a kitchen eating area with a table a small bunk room with space for 4-6. While you can sleep in the cabin, most people just stop in to sit down and have a snack out of the weather or hang out on the porch. There’s also a nearby privy. There’s been a rain barrel situated outside in cabin in the past, but I’d be very hesitant to drink water out of it, even filtered water. Continue along the Kilkenny Ridge Trail, descending by switchbacks, passing the unmaintained Mt Cabot Trail (which has been closed in a landowner dispute), to a junction with the Bunnell Notch Trail. Continue right, climbing Terrace Mtn, passing a short spur trail to its southern-most peak (3665′), before dropping down into Willard Notch and the York Pond Trail junction. There is a primitive campsite just before the junction on the right (see the White Mountain Guide, p. 573) near a small brook. Passing through the junction, continue heading south towards North, Middle, and South Weeks Mountains, passing through fern carpeted forest and moss covered trees. The forest here is unlike any other area in the White Mountain. There is an intermittent stream south of North Weeks, but that’s the only potential source of water along this section of trail until the bottom of the Starr King trail. Continue along the ridge to Mt Waumbek at 22.2 miles. While the summit is viewless, there is a small, east-facing opening just north of the summit, with a view of the Crescent Range near Randolph, NH. The Kilkenny Ridge Trail ends on Mt Waumbek in a typical New England fashion, far from a road or trailhead. Continue straight (south) along the Starr King Trail toward Jefferson, NH, reaching the summit of Starr King Mountain (3907′) in 1 mile. This peak is named after Thomas Starr King, author of The White Hills: Their Legends, Landscape, and Poetry, an influential description of the natural history of the White Mountains published in 1859. While Mt Starr King has a view, it’s probably best known for the stone chimney on its summit, the remains of an old cabin. From the summit, continue south, through forest as the trail drops gradually and soon parallels a noisy mountain stream that empties into the Israel River. Near the bottom of the trail, you’ll pass an old stone well, before arriving at the trailhead parking lot and the end of this journey. About Philip Werner: Philip is the 36th person to finish hiking and backpacking all of the trails in the White Mountain Guide (1440 miles). He's also finished hiking many of the region's peakbagging lists including the White Mountain 4000 footers, the 4000 footers in Winter, the Terrifying 25, the RMC 100, and the Trailwrights 72. Philip is a 4 season backpacking leader for the Appalachian Mountain Club, a member of the executive committee for the Random Hikers, a Long Trail Mentor for Vermont's Green Mountain Club, and a Leave No Trace Master Educator. He also teaches several compass, GPS, and off-trail navigation courses each year, listed on Outdoors.org. This trip plan can not alert you to every hazard, anticipate your experience, or limitations. Therefore, the descriptions of roads, trails, routes, shelters, tent sites, and natural features in this trip plan are not representations that a particular place or excursion will be safe for you or members of your party. When you follow any of the routes described on SectionHiker.com, you assume responsibility for your own safety. Under normal conditions, such excursions require the usual attention to traffic, road and trail conditions, weather, terrain, the capabilities of your party, and other factors. Always check for current conditions, obey posted signs, and Backcountry Camping and Wilderness Area Regulations. Hike Safe and follow the Hiker responsibility code. Is there any shuttle service or are two cars required? Trail Angels Hiking Services (will transport you from end to end or from end to midpoint (more or less the hatchery). Dan (owner) is a great guy and I have used him on numerous hikes including from the hatchery to South Pond and from Waumbek to the hatchery. Philip thanks for info, I have half my 4000 footers done and have a lot of the more remote ones to do . Great site! I did the Kilkenny Ridge in…2005 or 2006 as part of a section hike of the Cohos Trail. Finding water was definitely an issue up until Unknown Pond. View from Rogers Ledge still one of my favorites in the Whites. Rogers Ledge is pretty fantastic. Looks like a great trip! I enjoyed my climbs of Cabot and Waumbek when I was working on the 4000-footers, and it would be great to see some of the connecting trails, too.